Here is the story of David v. Goliath, again; the story now commonplace as hospitals and health care providers consolidate and corporatize. Queen of the Valley is typical of rural healthcare, it is relatively small, it serves a poor, aging population, financially it is weak, its employees struggle. Still, it is the hospital in Napa, the town, the largest employer in Napa, the county. Locals sometimes refer to it in loving terms. The Queen was founded in 1958, as a link in the St. Joseph Health System; it has 211 beds and 420 service and tech workers (including nursing assistants, pharmacy technicians, and respiratory care practitioners). It treated 27,000 patients in 2016. St. Joseph, then headquartered in Irvine in Southern California, wouldn’t have been considered union friendly, yet it accepted successful organizing by the National Union of Healthcare Workers (NUHW) at four of five Northern California hospitals – Santa Rosa, Petaluma, Eureka and Fortuna. In November 2016, Queen of the Valley workers followed suit, voting overwhelmingly to join. Few expected difficulties as bargaining began. They were mistaken. The hospital’s management now reflected the objectives of the new owners, Providence, of Renton, Washington. Management withdrew recognition of the election and the union in March. Providence merged with St Joseph Health in spring, 2016; this combined entity employs 110,000 people in seven western states. It manages 50 hospitals; its annual revenues are predicted to be more than $20 billion this year. Hochman is an Ivy League grad, an empire builder, a liberal “mover and shaker.” For this his compensation is in the millions; he has multiple pensions; his world is the corporate world. He wants to make an “impact,” yes, but what kind of impact? NUHW members at the Queen feel that they are on the receiving end of Providence’s business model of healthcare delivery – where the workforce is to be rationalized, the patient is a customer, and the bottom line rules – for-profit, not for-profit, it matters little. They’re becoming objects, not agents in healthcare provision. Caregivers at the Queen insist that the hospital is pocketing big profits while understaffing units and making patients endure dangerously long waits for emergency care. They work to help people, not to build empires, but they too must survive. They have filed charges with the National Labor Relations Board (NLRB); they assert that Providence has illegally withdrawn recognition of their union and is coercing workers into accepting this. Queen of the Valley CEO Larry Coomes claims that the hospital “does not believe the election held in November ensured all of our employees had a free and fair ability to vote in the election,” though this, of course, in a reversal of the hospital’s initial recognition of the results and the union. The NLRB, responding to NUHW complaints, challenges this; in turn, it has issued a complaint against Queen of the Valley. Regional Director Jill Coffman has accused the hospital of violating federal labor law. She found that management “threatened employees with unspecified charges for engaging in union activities” and “denied an employee’s request for representation,” also that administrators “changed work schedules’’ to discourage employees from engaging in protected activities. The workers are now waiting; another NLRB decision is expected within the month and they are hopeful. Still, many wonder why the hospital has gone to such lengths – and at such expense – to deny them their basic rights. In the meantime, the struggle continues. On August 28, 150 employees, friends and neighbors joined a vigil outside the hospital. Caretakers spoke of their love for the Queen and their fear that under the leadership of Providence St. Joseph Health things are changing – for the worse. Kelly O’Neill, a respiratory therapist, questioned the hospital’s staffing levels considering recent data showing that it netted a $10 million profit last year. “Sacrificing patient care in the name of the bottom line goes against everything we stand for,” he says. Supporters at the workers’ vigil included North Bay Jobs with Justice, Napa Valley Democrats, the Napa/Solano Central Labor Council, UNITE HERE! Local 2850 and the Napa Valley Educators Association. “We have to win here. This movement is typical of what’s happening in the North Bay. There are so many low-wage workers, immigrants, women, young people – and they’re under attack.” Bennett insisted it can be done, pointing to recent victories in neighboring Sonoma County where the Teamsters have won a big victory for waste haulers and Unite Here has won at Hyatt in Santa Rosa. Napa County, best known of course for pseudo-Chateaux and grapes, is awash in wealth, as are neighboring Sonoma and Marin Counties. Yet, poverty persists, inequality glares. The truth of the pudding, it’s said, is in the eating, and the truth is that for US workers victories have been few and far between lately, and, alas, defeats sometimes staggering – Volkswagen, Boeing, Nissan – can seem inevitable. There is much that needs saying about these, indeed much is being said. But, then, the importance of this story; let’s not forget what can be won. True, Queen of the Valley is, as things go, small, but it is also a link in a corporate chain that is massive, its scale is industrial. This victory (so far) then is significant, even more so because it is just one of many being won by NUHW at workplaces up and down the state of California. NUHW membership now tops 13,000, up from zero in 2009 – no small achievement. My coworkers and I unionized to gain a voice in patient care, once it became apparent new corporate leadership was more interested in profits than patients. The response by Providence St. Joseph corporate executives – to deny our rights, wage an expensive legal battle and threaten us with reprisals – has been truly sad and shameful. In spite of the intimidation tactics, I’m hopeful because we’re fighting for something we truly believe in: our patients and our families. They’re depending on us, and we won’t be giving up any time soon. Readers – before rushing to Seattle’s Providence St Joseph’s Health’s Swedish Hospital for brain surgery – should check out the “apology” (a full-page advertisement in the Seattle Times) of CEO Dr. Rod Hochman. This,” apology,” is in stark contrast to his initial response to criticism of Swedish– “This is not a democracy!” exclaimed the liberal Seattle billionaire. He was referring to, among other things, the practice surgeon of Dr. Johnny Delashaw -apparently one of celebrated surgeons Hochman had recruited to enhance the hospital’s climb to the top of the ranks. Delashaw came to Swedish from California in 2013, despite investigations and allegations there, according to the Times (March 1, 2017), “that he may have performed unnecessary surgeries and that his patients had high rates of medical complications. The Times investigated numerous internal concerns about patient care, and the frustrations of staffers that their concerns weren’t being addressed. — particularly when it came to Delashaw. “Swedish embraced contracts that incentivized doctors to pursue a high volume of procedures, and some doctors managed their workload by running multiple surgeries at the same time. The number of cases and overall billings grew dramatically over the past several years. “Four current and former staffers who asked to remain anonymous expressed concern that the OR would have to pause to wait for Delashaw in the middle of the surgery, with the patient’s body opened up and under anesthesia. Stay tuned. The Attorney General has removed Delashaw’s license. Investigations continue. A Strike for Free Speech for Workers? August 23, 2017. 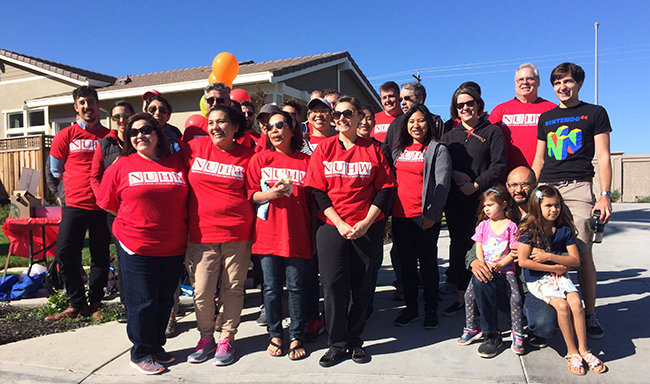 Nursing home workers picketed the San Rafael Health and Wellness Center in Marin County, CA, demanding that Brius Healthcare finalize negotiations with workers and their union, the National Union of Healthcare Workers (NUHW). The strikers, employees of Brius, California’s largest nursing home chain, insist on maintaining their watchdog website, Brius Watch.org: “Keeping an Eye on California’s most Notorious Nursing Home Company” Brius wants it down. (See “Life and Death in Health Care’s Trenches,” CounterPunch, October 6, 2016). Brius Watch keeps tabs on the (mal) practice of this chain of 81 nursing homes, as well as on its right-wing, Southern California billionaire owner, the high-flying Shlomo Rechnitz. Brius workers are demanding wage increases – few can afford to live in this richest of California’s counties (median family income, $120,000). They also want proper staffing and resources. State regulators have cited Brius for expired food and inadequate supplies. Cal Winslow is Director of the Mendocino Institute. His latest book is River of Fire, Crisis, Commons and the Imagination. He is editor of E.P. Thompson and the Making of the New Left and author of Labor’s Civil War in California. He lives with his family near Caspar on the Mendocino Coast. He can be reached at cwinslow@mcn.org.